Maddy Costa writes on the community-building, conversation-starting power of Theatre Clubs, which make space for audiences to discuss the work they've seen. £¥€$ (LIES) by Ontroerend Goed. Photo: Michiel Devijver. The group of people gathered around a meeting table at the Attenborough Centre for the Creative Arts in Brighton are not habitual theatre-goers; nor are they people I would in the general course of life have a long conversation with after seeing a show. But here we are, sharing plates of biscuits, teas and beers and lemonades, having an impassioned discussion about Ontroerend Goed’s £¥€$ (LIES), which we’ve just participated in together. A lot of them live on the Bevendean estate in north-east Brighton, on a tight financial budget, making the show’s high-stakes casino-like form particularly acute. 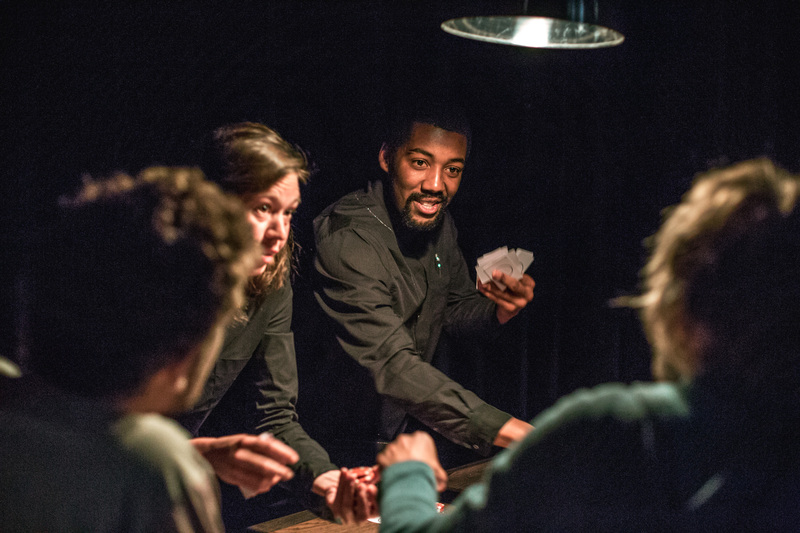 Throughout the show we are encouraged, goaded even, to gamble as though playing the financial markets, and although we play with coloured chips, everyone has had to hand over real cash at the beginning, inspiring genuine anxiety in some. Maybe financial traders and hedge-funders would behave more responsibly if the £20 they were holding in their hand were all they had to feed their kids all week, muses one woman. We talk together for more than an hour, everyone pitching in, a vibrant debate taking in how it felt to be part of the show, how it relates to our every day lives, what it made us think about bankers and the governments they hold in their sway (nothing good, to be honest), but also what we thought about it theatrically, the architecture of it, the performances. I’d enjoyed the show a lot – but I enjoyed it more for the conversation after, because I got a fuller sense of the spectrum of responses it elicited, noticed things more sharply that I might not have registered so clearly on my own. And that, in a nutshell, is why I’ve been hosting similar conversations, mostly under the banner Dialogue Theatre Club, roughly once a month for the past six and a half years. Dialogue Theatre Club brings a group of people, mostly strangers, together to talk about a performance we’ve all seen, sometimes directly after the show, sometimes a few days or weeks later. It functions like a book group, but for theatre; and, just as you wouldn’t expect Chimamanda Ngozi Adichie to turn up to your book group to talk through the nuances of Americanah, no one who made the performance being discussed attends Theatre Club either. Without the theatre-makers holding the focus of attention, the audience instead give that attention to each other, navigating the differences not only of opinion but of background between them, often disagreeing profoundly, but always listening and responding with interest and care. It’s such a simple idea I wish I could lay claim to it myself, but in truth Theatre Club was devised by community theatre-maker Lily Einhorn when she was programme manager for the Young Vic’s participation project, Two Boroughs (now called Neighbourhood Theatre). She had no idea, when it started in October 2012, that it would still be a regular fixture at the Young Vic today, with a Theatre Club happening for every main-house production. “This hunch that I had did tap into something that people needed, that maybe they didn’t know they needed,” Lily says now. She had set it up in the hopes of “building community”, specifically among people who mostly attend theatre alone, who don’t have anyone to talk with about the work they’ve seen – something Lily sees as an integral element to “the experience of going to the theatre”. But she also wanted to demystify what a critical conversation might be, moving away from the idea that people might need “the right language to talk about theatre. I wanted to say there is no correct language: your thoughts and opinions are valued and interesting, and I want you to feel emboldened to have them.” Those first few Young Vic Theatre Clubs were so invigorating, provoking such a wide array of thoughts, that I decided to start hosting more general discussions that anyone could attend, in theatres across London – and, thanks to producers Fuel, who began commissioning me to run them in 2013, across the UK. For Kate McGrath, director of Fuel, Theatre Club is a natural fit with “our ethos and values. I’m interested in the potential of theatre to change how people see or think or feel about the world: having the space to reflect on it and talk about how it made you see things or feel things or think things differently is an incredibly valuable part of that process.” That conversation can and does happen in the bar after the show; the difference with Theatre Club, she argues, is that it’s “fundamentally inclusive: everyone and anyone is invited into that conversation”. In a country as divided as the UK is by racism, inequalities of wealth, class stigmas and more, people increasingly isolated by the dismantling of social infrastructures and the privitisation of public space, opportunities for such inclusive conversations feel few. As Kate says, “We don’t often talk with people that we don’t know, who maybe have different political opinions from us or different ways of seeing the world or communicating. As citizens it’s important to spend time with people you don’t know, and hear what they think.” Theatre Club creates a “relaxed, informal, open, inclusive” environment in which it’s possible to do that. One of the venues Fuel regularly tour work to is South Street in Reading, where Theatre Club has been a regular fixture since 2017. It’s hosted by artistic director John Luther, for whom the discussion space is a natural extension of the conversations he otherwise has with his audiences in the foyer of South Street after each show. Theatre Club gave him a way “not of formalising that, but making it more transparent and open”. Like Lily, he saw it as a way of “building a sense of community” – but his hopes have been exceeded by the ways in which it’s proven “a very good audience development tool. Even if people don’t like the show, they’ve really enjoyed talking about it and the actual discussion is a positive thing. And loads of friendships have come out of it: people now book tickets together to go to shows, which has been really nice to see.” This has been remarkably beneficial for South Street’s attendance figures: whereas other venues of its size with a similar programme might attract audiences of just 20 or 30, John says that figure accounts for Theatre Club regulars alone, making “quite an incredible foundation for our programme”. It’s hard to talk about Theatre Club in relation to audience figures because the nature of the event benefits from being small-scale. John is committed to Theatre Club “even though it’s a small number of people who will stay for it, usually around 10 or 15 people depending on the show”, because he knows its value can’t be measured in the quantity of people, rather in the quality of the conversation. I’ve hosted a couple of Theatre Clubs at South Street thanks to Fuel, and they’ve been strikingly memorable: for the honesty with which we discussed colonialism, shame and migrant experience as a group of mixed racial and ethnic background following Inua Ellams’ A Night with an Immigrant; and for the careful, bilingual unpicking of Andy Smith’s Summit, a show many at the discussion felt they hadn’t connected with at all, but were much more engaged by and interested in having spoken about it at length with each other. I’ll admit, not everyone wants to have such an extended, reflective conversation about the theatre they see: no less memorable is the Theatre Club for Yerma at the Young Vic, where one woman announced furiously that she didn’t want to intellectualise the show, she just wanted to feel it; or the Theatre Club for Galileo, also at the Young Vic, where another woman stormed out, because she didn’t want to discuss the politics of the work, only how good the actors were. But such events are rarities. Far more common is the shared sense of appreciating a piece of theatre more fully, by having five or 10 or 15 other pairs of eyes through which to see it, and sets of life experience with which it might resonate – like the evening at ACCA with which I opened. That evening was organised by Naomi Alexander, artistic director of Brighton People’s Theatre, who has commissioned me to host a number of Theatre Clubs this year (and blog more generally about BPT’s activities; this text is being paid for by BPT as part of that series). She first came across Theatre Club when I hosted one for the Chris Goode show Men in the Cities at Brighton Dome in November 2015. She had only recently begun testing out her idea for a Brighton People’s Theatre and describes the evening as “formative” for that group: they were inspired by the show, but also by the conversation, which went “deeper and further than the conversation you might have with your mates”. It was also important to her that her participants, most of whom were part of the Brighton Unemployed Centre Families Project, were part of a discussion with people from different backgrounds, so that there was “a really broad diversity of perspectives” around the table. When organising the programme of events for the relaunched Brighton People’s Theatre, Naomi wanted there to be “a variety of different routes in. Seeing a show and having a chat about it afterwards is quite low-risk: people can rock up and be themselves, and whatever their reaction is, it’s valid.” Her aim with BPT isn’t just to create a new company of theatre-makers: “We’re trying to change the way theatre is made and consumed – it’s both.” Like Kate and John, Naomi sees Theatre Club as an audience development tool, not only for BPT’s work but the entire theatre scene in Brighton. “Our partner venues are interested in different people to their usual demographic engaging in what they programme – and they’re interested in what they programme changing as a result of our work with them as well,” she says. Naomi’s point about how theatre is consumed is echoed by Kate, who sees in Theatre Club a challenge to the separation between artists and audiences. “Theatre is such a collaborative art form,” she argues. “At Fuel we talk about everybody involved in an evening at the theatre being theatre-makers: the artists, yes, and the creative team, but also the technicians, the venue, the bar staff, the audiences. Theatre doesn’t happen without all of those people coming together to make it.” And this is the other thing about Theatre Club being “fundamentally inclusive”: it’s not “about consumption”, but about “experience and acknowledging the role of the audience in what that experience has been”. Whereas the more traditional post-show conversation format, the Q&A, reinforces hierarchies, because “the artist has the authority and the answers”, Theatre Club is “more democratic: anybody can have a question and anybody can have an answer, or you can just have a chat and see what ideas emerge and riff off each other”. This is why I remain devoted to Theatre Club as a form, even though very few people pay me to host them, and the programmes I put together for Dialogue Theatre Club – which hop across London, in the current season taking in Soho Theatre, the Almeida, New Diorama, Battersea Arts Centre, and the Royal Court – I run entirely voluntarily (with the occasional payment in bottles of wine and packets of crisps to be shared among participants). It’s been suggested to me that by doing so much of this work for free I’m contributing to a culture of privilege in which freelancers are consistently undervalued and underpaid, and the only people who can afford to work in theatre are white and middle-class. In this, I’m guilty as charged. But, given the choice between abandoning Theatre Club on principle and remaining committed to it as principle, I will always opt for the latter. Why? To explain, I’d like to quote someone else, unconnected with Theatre Club. While putting this piece together, I’ve been reading a PhD by performance-maker Rajni Shah called We are capable of so much more: Experiments in Listening, and admiring the way in which she describes how “theatre and performance might enable a different kind of encounter between audience members … not in order to think the same thoughts or to see and hear the same things, nor in order for change to occur (though – importantly – it might, and often will), but in order to explore the possibility in the act of gathering itself”. I too am endlessly interested in the possibilities of gathering, particularly gathering to talk deeply and seriously, generously and lightly, with strangers. Month after month, Dialogue Theatre Club gives me – and the group of people who have become regular attendees, my own growing community – the opportunity to do just that: an experience I’d describe as invaluable and priceless. For more on Brighton People’s Theatre, and to find out when its Theatre Clubs are happening, visit www.brightonpeoplestheatre.org. To find out more about South Street Theatre Club, visit https://www.readingarts.com/south-street/theatre-club. To find out more about Dialogue Theatre Club or join the mailing list, contact Maddy via twitter.